I find it fitting that I, on Australia Day, am posting the one recipe my Australian friend Debs has has shared with me. The recipe, although not typically Australian (I think) is very good and easy. These little sweets are nice all year round; Debs introduced them to me at a summer barbecue and I made them for Christmas. Melt the mars bars, butter and golden syrup in the microwave or in a nonstick saucepan on the stove (it will take a little time; the mars bar is rather stubborn). Remove from heat and stir in the rice krispies. Spread out the mixture in a parchment paper lined tray. Refrigerate. 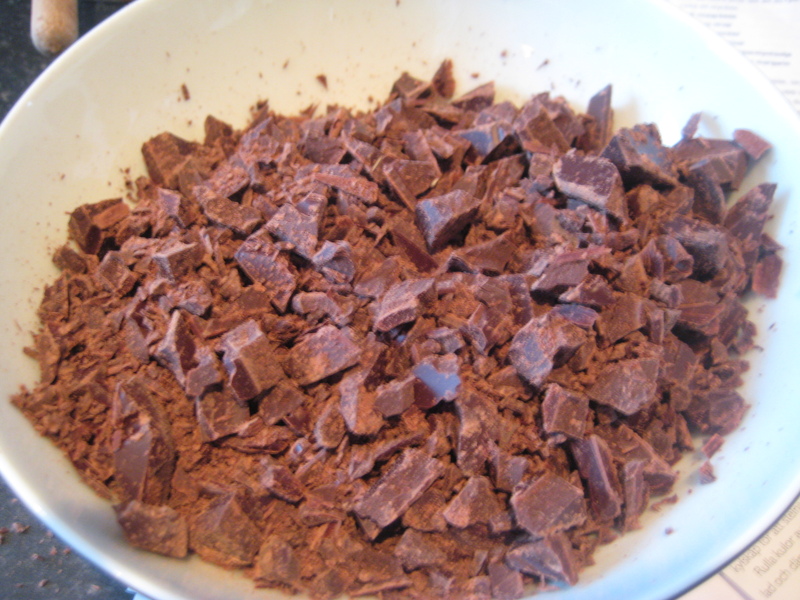 Melt the plain chocolate in the microwave or in a bain marie and spread onto the now firm rice krispie mixture. Leave to cool. Rocky Road is one of those simple recipes where the sum of the parts are greater than you expect it to be. Every single thing that goes into rocky road is nice in it’s own way, but together you have these amazing crunchy, soft, sweet and salty clusters that are just to die for. I altered the recipe I normally use when I made it in December for my Christmas drinks party and, I must say, the addition of honeycomb was just genius. I love honeycomb as it is, but I often find it a bit too sweet, so here where the buttery sweetness gets to mingle with salted nuts and semi-bitter chocolate it really comes together. I usually use Scandinavian Dumle toffees (which you can now buy from Ocado) but they were sold out so I opted for Reisen instead. They’re a bit harder (so be careful of your teeth) but not as sweet, which worked well with the other ingredients. Line a square 20 x 20 cm tin with parchment paper. Melt both types of chocolate together in a bain marie. In a bowl, mix marshmallors, Riesen, peanuts and honeycomb. Pour in the melted chocolate and mix well, making sure everything is coated with chocolate. Pour the mixture into the lined tin and smooth it out. Scatter with sprinkles and glitter and leave to cool. Let it set in the fridge. Cut into cubes and serve. Keeps in the fridge for up to two weeks. Sweets play a big role in Sweden. We are addicted to our pick ‘n mix (which is actually far better and represented in every single supermarket), love our cars and other chewy sweets. When I run out of Swedish sweets I resort only to chocolate, as British sweets usually disappoint in comparison. Also, the only chewy British sweet that I really like; Bassett’s wine gums, you hardly ever see here apart from at the airport.. But even though I don’t know how to make perfect wine gums at least I can vary the chocolate with this amazing chewy toffee. The recipe is straight forward and pretty standard, but it still tastes amazing! The easiest way to make toffee is to use a sugar thermometer; the toffee is ready once the sugar is boiling, at 120C. Or you can pour a spoonful of toffee mixture in a glass of cold water. If it easily shapes into a ball it is ready. 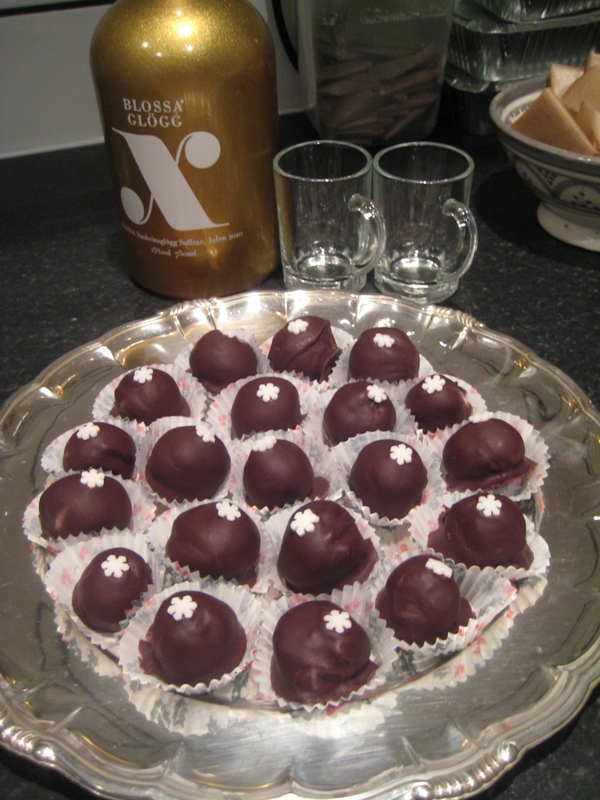 Translated from Johanna Westman’s recipe from the book Julgodis (Christmas sweets). Line a rectangular dish with parchment paper. Mix cream, syrup, sugar and butter in a saucepan. Scrape the seeds out of the vanilla pod, and add both seeds and pod to the pan. Bring to the boil and cook until 120C. Pour the mixture into the lined dish. Leave to cool. Cut into shapes and wrap in parchment paper or cellophane. I have seen cake balls in a few different blogs, among others the great Flickan & kakorna, and wanted to give it a try myself. When I made the love yummies the other day I can out of icing sugar and couldn’t ice the whole cake, so I used the left over cake to make cake balls. You just crumble it and mix it with frosting, roll into balls and dip them in chocolate. Easy peasy, and the result is delicious! I like them fridge cold the best, they are pretty rich as they are and at room temperature it is a bit too much. Crumble the cake into a bowl. I thought is was easiest to do this by hand. Mix in the frosting. Roll into balls. Melt chocolate in a bain marie, put sprinkles on top. Leave to set in the fridge. When I was at Uni in a town called Lund in the south of Sweden I worked part-time as a waitress at this small hotel in the countryside. It is a lovely manor house and had recently been made into a hotel and restaurant business when I started to work there. The three chefs were great and created lovely food from local produce. The house could be quite cold in the winter and the warmest place was of course around the stoves in the kitchen. We used to stand there a lot drinking hot cocoa or Jerusalem artichoke soup, try a bit of this and a bit of that. And every year in December we would open up the big banquet room as a temporary restaurant for the julbord, basically a Christmas themed smorgasbord. There was enormous amounts of food here, from pickled herrings, to Christmas ham, homemade sausages and of course a sweet section to finish it all off with. People always went mad coming here, both with the food and the snaps (much needed to help digest the food). I remember of course trying most things we served, but not all in one go as our guests. And this peanut butter flapjack is a recipe I kindly asked one of the chefs for. I haven’t made it for years and was surprised how nice it is, now that I made it again. Bring the sugar and syrup to a boil. Take away from the heat and add peanut butter and cornflakes. Spread out onto parchment paper in a tin. Leave to cool in the fridge. Melt the chocolate over boiling water and spread on top of the flapjack. Let it set and cut into squares. Last year I found this recipe on Allrecipes.com and really wanted to try it. I didn’t have time however, but made sure to have time to make it this year. It is lovely, and the marshmallow fluff helps to make it set. The only downside is the boring beige colour, but the flavour is great, so once people have tried it, they won’t care about the colour. And if you want to make the fudge look more appetizing, may I suggest wrapping them in coloured cellophane. Click on the link above to see the recipe. When I was home in Sweden last (in October) I found a few old folders with recipe clippings that I’ve found over the years. I decided to go through them all and only save the really good ones. This was a recipe that made the cut, but I have no idea where it is from. Lovely truffles, but I would like an even stronger muscovado taste. Might experiment with that last year. Can’t believe it is already a week into December, so this year I definitely won’t have time. Chop the chocolate. 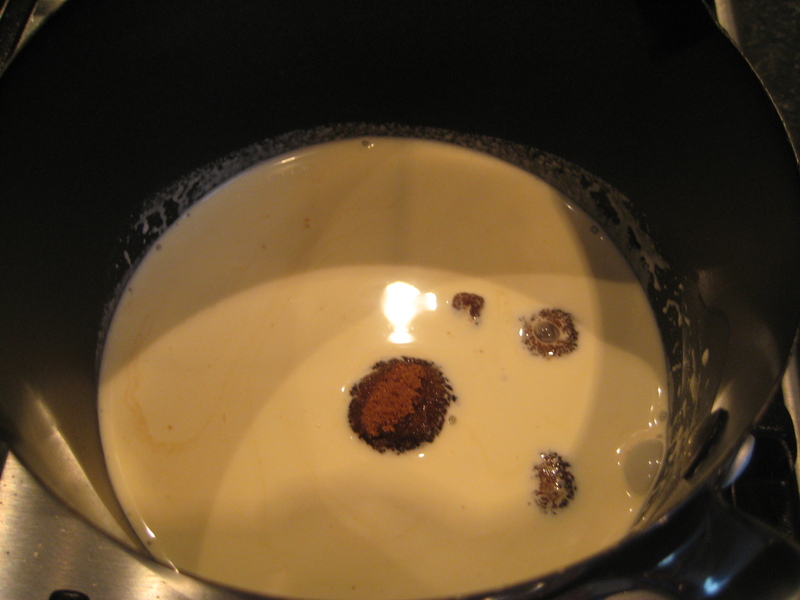 Combine cream and sugar in a saucepan. Bring to a boil, add the chocolate and stir until smooth. Add the butter and stir until smooth and glossy. Put the mixture in the fridge to cool down. 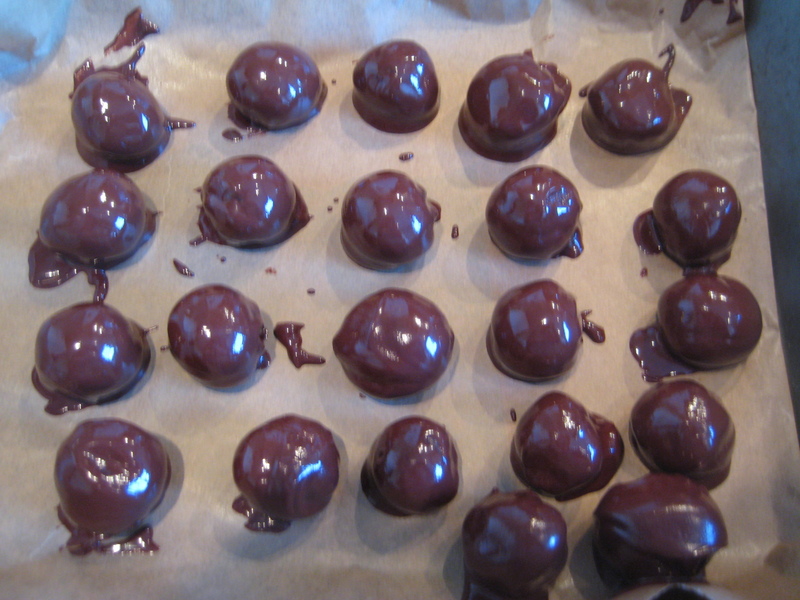 Roll into small balls, dip in melted dark chocolate and let dry on parchment paper. Add the snowflakes before the chocolate sets.